Gulafshan Khan, who is pursuing her master’s degree in Ancient Indian History Culture and Archaeology at Deccan College Post Graduate and Research Institute, Pune, expounded her lecture topic ‘Turning Visible the (In)Visible: The Muslim Heritage in Goa and its Preservation’. The Muslim minority in Goa is interwoven into the fabric of Goan society. This is a reflection of the ability of this land to integrate varied religions in a productive manner. The architecture of Goa is a good example of the merging of the styles of different religious communities. Let us consider how the Muslims first arrived in Goa. The spread of Islam began with the Arab traders who gained converts to their faith. The Omani traders were in Goa much before the Mohammedan Era. There is evidence of an Arab trading colony called Hanjamannagara during reign of the Rashtrakuta dynasty (c. 753 AD-c. 973 AD). Also, there is historical evidence that at the port of Gopakapattanam (Goa), a rich Arab named Mohammed aided Guhalladeva I (c. 980 AD-1000 AD) of the Kadamba dynasty when his ship’s mast broke on the way to Saurashtra. There are other examples of Muslims present on the west coast of India and particularly in Goa. This was well before the invasions from the Muslims of Central Asia, leading to the establishment of the Delhi Sultanate and later the Mughal Empire in India. Since Muslims have been here for centuries, it is not uncommon to see mosques and other Islamic monuments from different eras throughout the country. There were around 27 mosques in Ponda alone before the advent of the Portuguese, but most were destroyed or no longer used owing to the religiopolitical atmosphere during the Portuguese rule. 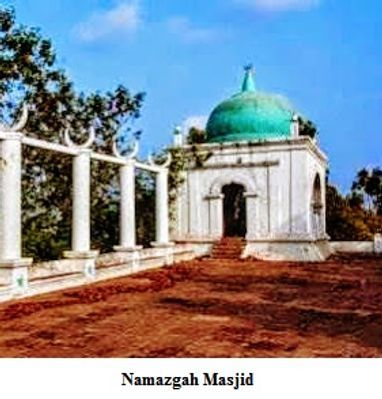 The mosque at Surla Tar is situated along the bank of the River Mandovi. It was built in the 16th century by Ibrahim Adil Shah (1534-1557). There are mehrab arches built with exposed laterite stone that surround a water tank near the mosque. Laterite columns capped with basalt can be seen around the mosque. The mosque’s architectural style is said to be similar to that of the Safa Masjid in Ponda. The more recent painting of the mosque has reduced the historical authenticity of the structure. The Pir Saheb (saint) whose dargah (shrine or tomb) is behind the Surla Tal mosque is associated with the local deity Sri Sidhdeshwar, making the dargah a place of reverence for Hindus and Muslims alike. Godd Bangal is the local name given to the Pir Saheb of the Surla Tal mosque. During the Shigmo festival, a procession to the dargah at Surla Tal takes place. The Muzzawar family maintains the shrine as well as overseeing important festivals and celebrations related to the Pir. 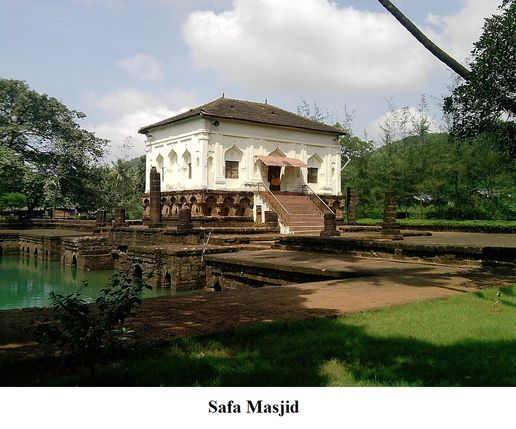 The Safa Masjid was built in the 1560’s by *Adil Shah of Bijapur. The Arabic word Safa means ‘pure’ or ‘chaste’, the name therefore notably denotes the spiritual state of the devout Muslim. One of the most well-preserved mosque of its time, the Safa Masjid is seen on a raised platform. The inclusion of a water source adjoining the mosque is typical of Islamic religious architecture. The water tank here is made up of laterite stone and has dressing chambers called vajukhana where the devotees would undergo a ritualistic bathing or washing of feet before entering the mosque. The Palace of Adil Shah in Panjim was built in the 1500s by Yusuf Adil Shah (1489-1510). The stately two storeyed monument was built as a summer palace complete with gardens and stables. Its three grand arched entrances and lofty staircases are described in records. The only original part of the palace is the basalt rock doorway found close to the Church of St Cajetan in Old Goa. ‘This basalt doorway has been assumed to be transplanted from a Hindu temple. However, this has been challenged,’ says Gulafshan Khan. Under the Portuguese the palace functioned as a rest house and a stopover house for any viceroy about to take on the mantle of his position or as he was taking leave of it. After 1961, the palace housed the Goa State Legislative Assembly until its shift to Porvorim and at the moment it operates as a museum. There is little information about the ruins of a mosque at Khandepar. The monument is made up of exposed laterite stone, covered by vegetative growth. There is a mehrab arch which is quintessentially part of Persian architecture and indicates that it belongs to the Adil Shahi period. These lesser known heritage sites do not have the privilege of being labelled as world heritage sites and merit the conservation that follows. Some of these structures have been altered without proper planning, leading to the decline in their cultural and historical value. Encroachments by locals and even the government have proved detrimental as well. Large scale tourism without necessary protection of historical monuments has led to tourists with a less than desirable civic sense causing unpardonable damage such as inscribing names, graffiti, etc. Pollution is another major problem that can erode, scar and discolour heritage monuments. Shock waves from noise pollution (aircrafts, music concerts, etc) can also cause damage as seen in the case of the Khajuraho temples. Dumping of garbage on these historical grounds is a real concern. Light and sound shows by the tourism department of various states have a negative impact on the monuments. Miss Khan proposes that public awareness is key to safeguarding heritage monuments and this should begin with introducing this information to school students to nurture a sense of pride in them. Tourists should be provided with brief literature regarding the site and tourist police should be employed to ensure the safety of monuments and visitors. Information about heritage locations and monuments should be disseminated through print and electronic media. The role of the Archaeological Survey of India is significant in preserving historically valuable monuments. As of now, there are just a few Muslim heritage monuments that are protected such as the Safa Masjid and the Arch of the Adil Shah Palace. The Muslim structures need to be studied more since each edifice requires specialised treatment. The key is not to renovate or destroy but preserve what we have in an effort to have a firm foundation that will help us look confidently to the future.